Brigitte and the story of THAT cake. 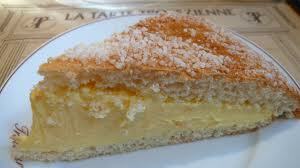 Having fought a very irate French lady for the last piece of ”Tarte Tropezienne’ in my local patisserie in Antibes, where I’m spending a late summer holiday, I thought I would research the origin of what looks like just an ordinary sponge cake, filled with custard. But it’s not. Bite into it and you’ll discover it’s a piece of pure heaven. To die for. To fight with aggressive French females within an inch of your life for. To risk an additional spare tyre for. To… I could go on and on. But where did it come from? And what’s the secret ingredient that makes it so sublime? The story started in 1945, with a young Polish ‘parachutiste’, called Alexandre Micka, who took part in the liberation of the French Rivera at the end of WWII. To cut a long story short, he liked the place so much, he stayed, married a French girl and opened a bakery in St Tropez. Once installed, our Alexandre used his mother’s recipes from his native Poland, one of which was for a cake with a vanilla flavoured filling (plus that secret ingredient) which became a local speciality. Wind the film (literally) forward to 1952, when a young director called Roger Vadim was making a film entitled ‘And God Created Woman’ with a young starlet by the name of- you guessed it- Brigitte Bardot. Alexandre Micka got the job of catering for the film crew and the soon-to-be- famous cake was served daily. ‘You should give a name to this dessert,’ said Brigitte (who, judging by her figure only indulged in the occasional nibble) and so, the ‘Tarte Tropezienne’ was born. And now it is served in every good patisserie on the French Rivera. The secret ingredient? Nobody knows. Every time I taste it, I get a different flavour; sometimes almond, or apple or rum. But who cares? It’s gorgeous.